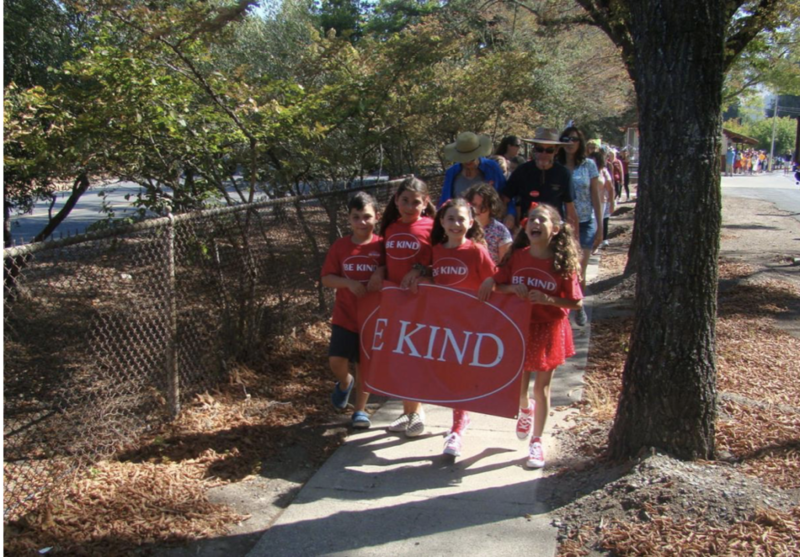 “Kind!” responded the parade of people following the bright red ‘Be Kind’ banner that has been seen throughout Napa Valley over the past year. As walkers reached the Napa Valley Museum, they pooled into the patio area in front of the museum where they were greeted with live music, bottled water and treats. 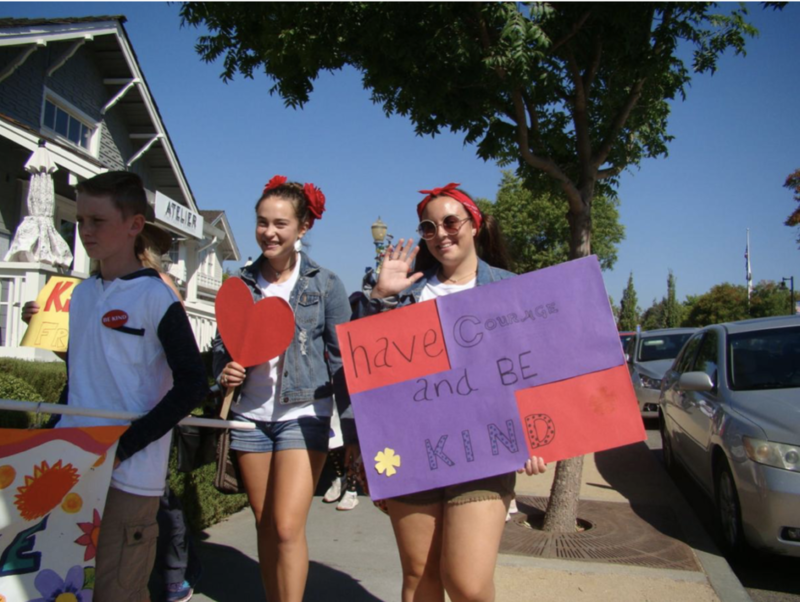 The Be Kind Napa movement has one goal: remind people to treat each other with kindness. 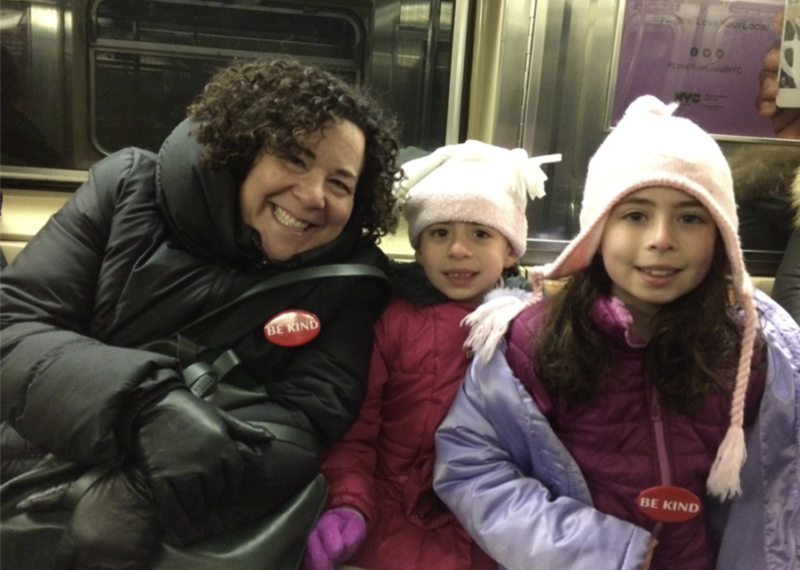 The Finkelstein sisters dole out red ‘Be Kind’ buttons wherever they go. Holly Finkelstein, mother to Talulah and Ruby, said she couldn’t be more proud of what her daughters have started. The girls were inspired by family friend Laurie Phillips from New York. Phillips noticed that people in New York City could be cold and unfriendly, so she created the ‘Be Kind’ button as a way to start a conversation and offer a dose of kindness to anyone who commented on her button. When Talulah and Ruby heard Phillips’ story, they asked their parents if they could do something like that in Napa, and Holly and husband Judd decided to embrace their daughters’ mission with open arms. 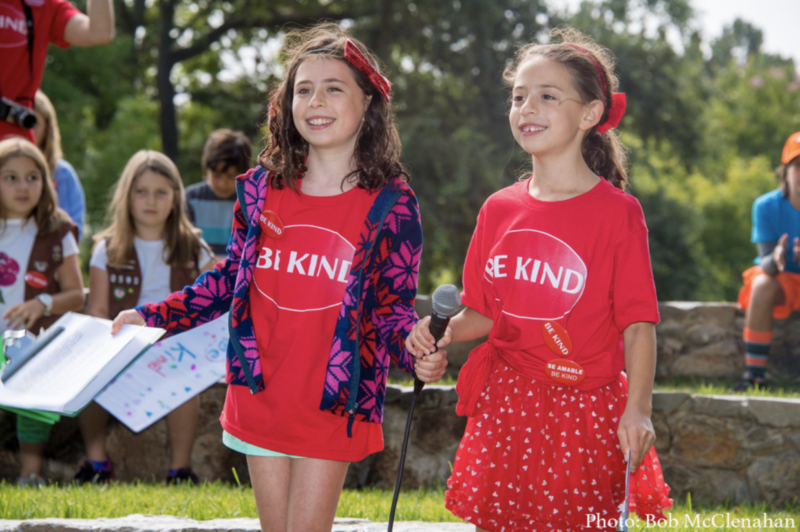 Holly said the crowd of well-wishers and walkers increased from last year’s debut event, and she hopes the Be Kind Walk and the Be Kind Napa movement will continue to grow. She said the girls have given talks at schools locally and as far as Hawaii. She said the girls are also working with a young girl in Chicago who heard about their movement and wants to replicate it in the Windy City. Ashley Diener brought daughter Millie Diener-Malarek, 5, to the Be Kind Walk. During the ‘Be Kind’ celebration, Millie drew a heart on a large ‘Be Kind’ banner that participants were encouraged to sign and decorate. Following the event, the banner was to be hung inside the Napa Valley Museum. As the celebration was winding down, Talulah took to the stage to offer parting words of wisdom to the crowd: “Everyone is who they are meant to be. That’s just who they are, so don’t judge anybody or don’t comment about anybody even if they might look different or talk different or whatever. They might be a really nice person, so just be kind to them. If you don’t, that is where hate and prejudice come in, and we don’t want that at all. Earlier in the morning during a rally before the walk, Napa County Supervisor Brad Wagenknecht read a proclamation declaring Aug. 18 as Be Kind Day in Napa County. To learn more about the Be Kind Napa movement, visit bekindnapa.com.